Need a photo for a Vietnam passport renewal or visa application, and you are not sure of the rules for the photograph? Simply review and follow the Quick Facts below and My Passport Photos will do the rest to make sure that your photo is compliant. My Passport Photos has processed thousands of passport photos for applications and will be sure to get it right. To save additional time and money visit www.ivisa.com to decide whether you need a visa. iVisa can minimize the hassle of obtaining a visa by processing your application online. Size: 2x2 inches or 4x6cm for the visa photo. 4x6cm only for passport photo. Color: RGB only. No filters or black and white. Head size and position: Face the camera. Shoulders squared. Recency: No older than six months. Background: Solid, plain bright. No colors. Smile: None. Keep a neutral expression. Eyes: Must be visible and open. Glasses: Only if eyes can be clearly seen. Attire, clothing, dress code: Don’t wear white as it blends with background. Beard: If you wear one normally, than ok. Otherwise no. Sizing is not strict unlike other governments. If you’re a nanometer off, it’s ok. For a visa photo, you have the option of a 4x6 in centimeters or 2x2 in inches, which is 5.08x5.08 in cm. It doesn’t matter which you chose. 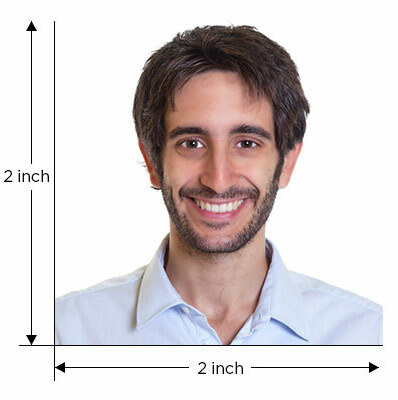 For a passport photo, however, the photo must be a 4x6cm. Head sizing is not specified. No need to measure how big or small your face is as there are no rules on it. This doesn’t mean to zoom in on your nose or be so far away your face isn’t clear. Eyes need to be visible and looking directly at the camera. Prescription glasses are allowed so long as the frames are not thick, lenses aren’t tinted and there is no glare. As with most countries, no smiling. Keep your face relaxed and mouth closed. Each application needs two pictures printed on glossy photo paper. Keep lighting even across your face. By doing this, you rid any chance of shadows. Hair can be down so long as it’s not blocking the face. Hats, large hair pieces and gaudy jewelry shouldn’t be worn. If you require a headpiece for medical or religious reasons, it cannot obstruct the view of your face. No one else can be in the picture. This is the number one issue and cause of rejection for infant photos. Keep toys, bottles, pacifiers and other objects out of the image. If laying the child down or sitting in a chair, place a white sheet behind the baby. This way the background is solid white and mothering else is visible. Do your best to square up the child’s face and snap the picture with eyes open. Sizing and technicalities such as lighting stated above apply. Trying to figure out where and when to get a photo done for your passport or visa can confuse anyone these days. You have many options, from post office, local drug stores or taking a chance online with countless websites. Before jumping into a more comfortable idea or suggestion from a friend, take into consideration the cost of not just the photo itself but of fuel to get you around town and time. It takes a few hours if nothing goes wrong if you chose a post office for example. Not to mention, a set of 2 photos cost around 356,903 VND. Multiply that by 3 or 4 other family members and you’re in the seven figure range. Save that money for vacation! At MyPassportPhotos.com, a set of 2 passport or visa photos cost you 140,808 VND. You can afford to take the entire family and stuff the wallet with spending money. The world is a playground and is only limited by your imagination. We at MyPassportPhotos.com believe you should experience the richness of the globe without wasting time or money. Our easy to use website allows you to freely work through a quick process and get your own photos done from home or the office. Use the passport photo booth with a tablet or smartphone and avoid traveling to find a professional photographer. We offer a 100% guarantee of government compliance before submission with your application. If you are not happy with any photo you have submitted, take as many retakes as you please at no extra charge. Our knowledgeable staff fine tunes each photo so you don’t have to worry. If you encounter any issues or have questions, there is always someone standing by to answer them. Give us a try and soon you’ll be jetted off into the horizon.